SAULT STE. MARIE, Ont. – Rookies Max Kislinger and Cam Dineen scored rapid-fire goals early in the second period and the North Bay Battalion survived a late Sault Ste. Marie Greyhounds rally for a 3-1 Ontario Hockey League victory Saturday night. Zach Bratina scored into an empty net and goaltender Jake Smith made 32 saves. Smith earned his 62nd career win, third on the Battalion’s all-time list, one ahead of Brad Topping and one behind Patrick Killeen. Bryan Pitton holds the club record at 64. North Bay, which hadn’t played since a 5-4 home-ice win Oct. 2 over the Sarnia Sting, has a won-lost-extended record of 2-3-0. Tim Gettinger scored for Sault Ste. Marie. Starting goaltender Joseph Raaymakers gave up two goals on 20 shots before being replaced by Brandon Halverson at 6:34 of the second period. Halverson faced 19 shots before 4,126 at the Essar Centre. The Greyhounds, who fell 5-2 Friday night to the visiting Saginaw Spirit, are 4-2-2. The goals by Kislinger and Dineen 1:38 apart in the middle frame chased Raaymakers and brought Halverson into the game. Kislinger scored his first OHL goal at 4:56, snapping the puck over Raaymakers’s shoulder from deep on the left wing on a rush. 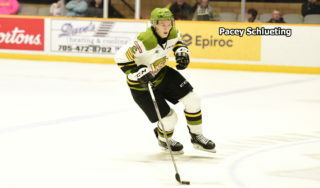 Kislinger, a resident of Garmisch-Partenkirchen, Germany, was the Battalion’s first-round pick in the Canadian Hockey League Import Draft in June. Defenceman Dineen doubled the lead when, playing the trailer, he collected Mike Amadio’s blocked shot and converted from the left-wing circle for his first career goal. 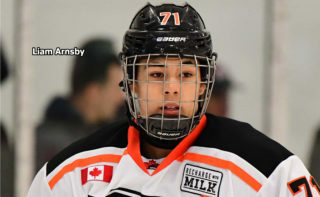 Dineen, a Toms River, N.J., product, was an 11th-round choice in the 2014 OHL Priority Selection. The assist gave Amadio, a Sault Ste. Marie native, 130 career points, tying Chris Clayton and Matt MacLeod for 21st place in franchise history. 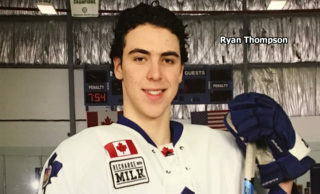 In 200 OHL games, Amadio has 42 goals and 88 assists. The Greyhounds did a solid job killing a major penalty for checking from behind issued to Bobby MacIntyre at 14:35 for a hit on Jacob Ball, limiting the Troops to a few early chances. MacIntyre also drew a game misconduct on the play, which forced Ball from the game. Bratina drew hooking and unsportsmanlike conduct calls at 19:56, putting the Troops down a man to start the third period. They killed both penalties, with Calvin Gomes giving Halverson fits when the goaltender dashed almost to the blue line to play the puck, got tangled up and barely dished it off. Gettinger struck on a quick shot from the left lip of the crease at 15:07, and the Greyhounds besieged Smith for most of the rest of the game, including with six skaters, until Bratina worked past a defender on the right wing and skated across the goalmouth to slip the puck into the vacant net at 19:06. Assists went to Brett Hargrave, a North Bay native who earned his first point with the Battalion in his second game since a trade from the Owen Sound Attack, and Miles Liberati. North Bay came out of the gate strong in the first period and posted a 15-8 edge in shots. Bratina was alone in front of Raaymakers in the fourth minute but failed to beat him on a deke, and Hargrave was denied by the left pad on an eighth-minute tip. Smith sprawled in front of Hayden Verbeek’s shot off a three-on-one rush in the 13th minute, and Ball’s screened shot off the right wing hit the left post in the 18th after he stripped Colton White of the disc. The Mississauga Steelheads invade Memorial Gardens at 2 p.m. Monday in the Battalion’s annual Thanksgiving Day game. BATTALION BULLETS: The Battalion went 0-for-1 on the power play. 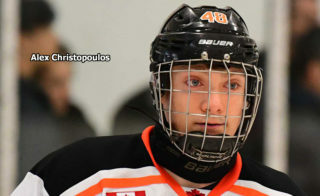 The Greyhounds were 0-for-4 … Opening line combinations featured Amadio centring left winger Bratina and right winger Hargrave, Brett McKenzie centring left winger Mike Baird and Zach Poirier on right wing and Kyle Potts pivoting left winger Kislinger and right winger Gomes. 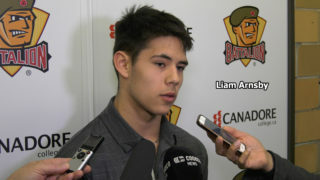 Ball centred left winger David Sherman and right winger Kyle Moore … North Bay scratched Kyle Wood, Jake Ramalho, Justin Brazeau, Brady Lyle and Mathew Santos, who served the second game of a four-game suspension … The Battalion released left winger Owen Green on Thursday, reducing the team’s complement of players to 25. Green, a resident of Williamsville, N.Y., played a total of 48 games, including two this season, with the Troops, scoring one goal and adding two assists. 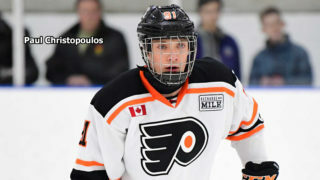 A ninth-round pick in the 2013 OHL Priority Selection, he was expected to join a junior B club in the Greater Ontario Junior Hockey League … Defenceman Lyle is among 24 OHL players named Friday to the 66-man Canadian list for the World Under-17 Challenge to be held Nov. 1-7 at Dawson Creek and Fort St. John, B.C. The Canadians are to play on one of three rosters, Canada Red, Canada White and Canada Black, in the eight-team tournament. North Bay native Lyle is sidelined with a broken collarbone.